Moving Connections provides professional local movers in Salt Lake City and the Salt Lake Valley. Moving Connections provides moving help throughout UTAH. Full Service Home Moves To Discount 1 and 2 Bedroom Apartment Moves. Check out Moving Connections' Monthly and Holidays Specials . Moving Connections is a Professional Moving Company located in Salt Lake City, Utah. Moving Connections provides affordable Local Movers for full service moves. Full service moves include a large 26 foot moving truck plus two or more men plus all the blankets, hand trucks, dollies and tools required to safely and quickly complete your move from one location to another. If you are leaving Utah or coming into Utah and have your own truck, e.g. a U-haul or Penske, or a POD or Trailer, Moving Connections will provide the moving labor, i.e. two or more movers to help you successfully load or unload your household or office belongings. Moving Connections is one of Utah's best Moving Companies offering family friendly pricing coupled with a great Utah Work ethic. 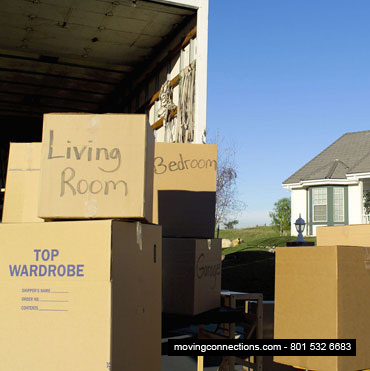 Moving Connections offers several different moving and packing options designed to fit your budget and work schedule. Moving Connections is a Top Rated moving company voted "Best in Utah" for business and household moves. Moving Connection’s service area includes the entire State of Utah and the Western United States. Most of the moves done by Moving Connections are within 100 miles of Salt Lake City, all along the Wasatch Mountain Range. These moving service areas include Weber and Davis Counties in the north, Salt Lake County in the center and Utah County in the south. For the benefit of those not from Utah, most Utahans refer to Salt Lake County simply as the Salt Lake Valley or even just Salt Lake. 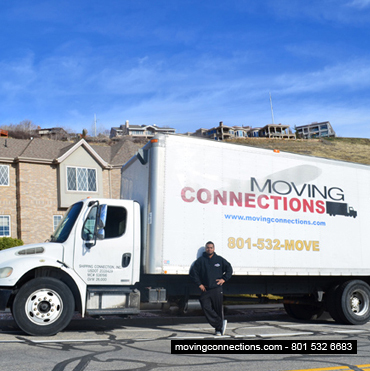 In this sense Salt Lake means Moving Connections has movers serving the cities of Salt Lake City, American Fork, Sandy, Park City, Murray, Holladay, Cottonwood Heights, West Jordan, South Jordan, Riverton, Sugarhouse, Taylorsville. We also have movers in Utah County and more. Residential Moves and Office Moves: Moving Connections' most popular moving service is the $95 per hour full service move. Two of our professional movers drive our 26 foot moving truck loaded with blankets and moving equipment to your origin address. Moving Connections blanket wraps your furniture and then loads it and your boxes onto our moving truck. At your destination we unload into the rooms and areas designated by you. Call 801-532-6683. 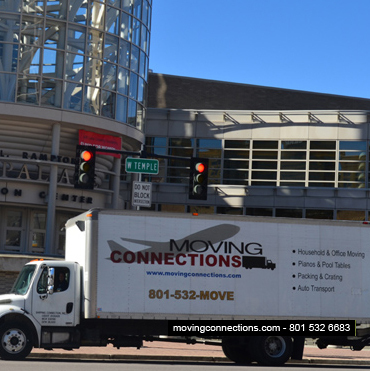 Long Distance Moving both in Utah and throughout the Western United States is a Moving Connections specialty. We at Moving Connections have a mission to provide the highest quality and most cost-effective interstate moving services. Moving Connections will assist you with all your long distance moving needs. Finally Discount Small Long Distance Moving is available for small moves throughout the Western United States. This Long Distance moving is perfect for studio, 1 and 2 bedroom apartments often for less than $2500. From boxes, bubble wrap, packaging tape and wardrobe boxes, Moving Connections is a one-stop shop for all your packing and moving needs. Our sister company is a U-haul Dealer so we're also surrounded by hundreds of moving pads, 3-ply moving blankets, tie-down rope and straps, 4 piece picture and mirror boxes, hump straps, wardrobe boxes and more. Moving Services: Timing Countdown Checklist Moving Help From Moving Connections. You may not be able to move mountains, but you can plan an organized move with a little help from this step-by-step timeline. Moving Services: What is Staging? - It's an effective marketing and organizing tool. By leaving some furniture, carpets, wall hangings, and window dressings, your home has much more appeal to potential buyers. How And When To Use Rental Trucks, Uhauls, Penskes, PODs and Trailers. What size of a Truck, Trailer or POD do you need and how to properly load and unload the vehicle. Moving Tips: How To Move The Big Stuff - Both household and office, including furniture, equipment and appliances. Follow us to get suggestions on saving money and getting ready for our movers. Moving Services: How Do I Move My Vehicle? Car Shipping and Auto Transport is a specialty of our moving company. Carnections is our car shipping service based in Salt Lake City, Utah. We service the entire U.S..
Use Moving Connections planning and organizing tips on how to hire a mover like Moving Connections or move yourself, pack your belongings properly, and move your home with less missteps. How to Pack Your Fragile items: Moving Connections shows you how to package Paintings, Lamps, Ceramics, Porcelain and Other Items that Require Special Care in Packaging.